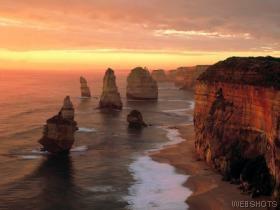 Next day we saw the Gibson steps, 12 Apostles and the Loch Ard Gorge (see photos) - all were very impressive. Then the long journey back to Melbourne to end up in our night destination of the Dandenong ranges. On the way we passed through Port Campbell and the road was quite scenic with lots of bushland to look at. We stopped off for a late late lunch in the Dandenong ranges national park after going through a great little place called Ferntree Gully! In the National park passed a cute place called Olinda we went to see the William Ricketts Sanctuary. William Rickett was an English deaf man who after loosing his hearing became in touch with nature. His inspiration was through nature and through aborginal culture and beliefs and he expressed himself through art work and sculpture that he carved out of clay and moulded them against rock and tree - see pics they were amazing! After this we went past the Emerald lakes and Puffing Billy steam train and spent a tiny place called NAR NAR GOON next to a railway station - complete and utter Pikey's ha ha! We spent the next two days heading up to Sydney passing through places like Lakes Entrance, Batemans Bay, Eden and Naroomba (all gorgeous!) - we stopped for a night in a place called Wollongong where we saw the new James Bond movie - AMAZING!!!!! My god that BODY!!!!!!!!! We also visited the largest Buddhist temple and sanctuary in the Southern Hemisphere called the Nan Tien Buddhist Temple. It was out of this world - with over 10,000 buddhists, the temples had a very calming and relaxing effect on you and you really did (without trying to sound cheesy) feel at one with the surroundings. There were lots of statues of baby buddhas and we though the ones depicting excersise were extremely cute - see photos! We are now in Sydney having a complete blast - Bondi beach is wkd! Update soon pizza is calling and stomachs are growling!